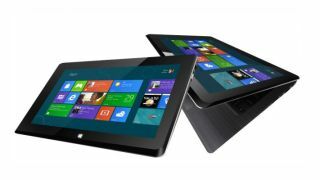 The Asus Taichi, the dual-screen, Windows 8-toting ultrabook, has been delayed for the second time. An Asus spokesperson confirmed the delay in an email to PCWorld. The spokesperson said the device could go on sale in December in the US, though it hasn't ruled out another delay. The ultrabook was originally supposed to go on sale at the end of October, at the same time as Windows 8. Several US retailers have stopped taking pre-orders for the product. In the UK, Expansys is still taking pre-orders, though the release date is given as November 19. The Taichi looks like a regular ultrabook, but has a second screen on the lid. Close it, and it effectively becomes a tablet. Two people can use it at the same time, too. Both screens are HD resolution as well. Inside is a 128GB SSD, and 4GB of RAM. And while it might weigh more than a tablet, it's still among the lightest laptops out there. It's a real standout device, with a USP making it a world away from all the iPad clones we've seen - and we're currently reviewing our sample. It'd be a real shame if we had to endure a long wait before it reaches the shelves.